If you’ve made money investing in gold lately – you didn’t do it by being bullish. Gold prices are down 4% this year. And the value of gold is now 40% below the 2011 peak. Put simply, gold is in a bear market. Last month I pointed out that gold prices were on the verge of another big drop. 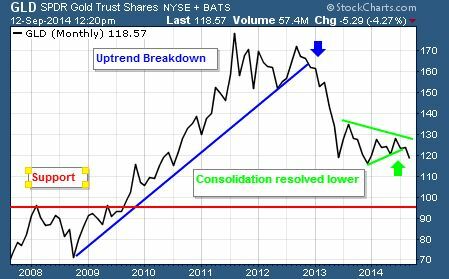 This chart shows SPDR Gold Trust Shares (GLD) made its all-time high in mid-2011. But the uptrend didn’t end until closer to the end of 2012 when it broke decisively below the upward trending support (blue line). 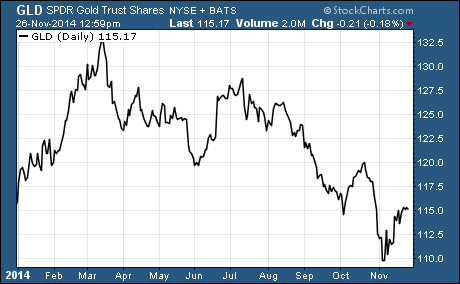 During the first leg down, GLD shed $50 per share in 2013 in a dramatic freefall. Then it went through a consolidation phase in a symmetrical triangle (green lines) over the last year. Now GLD is breaking below the support zone. There is a support zone at $115 that corresponds to the 2013 lows. But it doesn’t hold much weight. If GLD breaks below this level, it will likely take the next big leg down. That means we could see GLD fall 15% or more to around $100. Gold didn’t fall immediately. It got a bit of a bounce off of the $115 support zone that corresponded to the previous low. Then it ran into resistance at $120 and broke decisively below $115 on the next leg down. GLD has rallied back up to resistance giving us another great entry point to profit from another leg down in gold prices. Remember, gold has no intrinsic value. So more often than not, it follows the technical trends. And the technical picture for gold is bearish. One way to profit from the coming decline in gold prices is with an inverse ETF. These ETFs are designed to move in the opposite direction of the investment that they track. The most popular inverse gold ETF based on assets under management (AUM) is the ProShares UltraShort Gold (GLL). It has around $82 billion in AUM. GLL is not just designed to go up in value as the price of gold goes down, it also uses leverage. This leverage causes GLL to move twice as much as the price of gold on a given day. Right now GLL trades for $98.70. It has the potential to generate 30% profits if GLD retests the next major support around $100.